a) The reconstruction of six audiovisual programmes – Demontage: film, video / appropriation, recycling (1993); Urban Interventions (1994); Science-Friction:Technofables for the Twilight of the Millennium (1997); Calculated Cinema (1999 and 2001); To Eat or Not to Eat (2002–2003); and Peritelevision Disconnections (2007) – that allow us to understand some of Bonet’s main theoretical concepts. 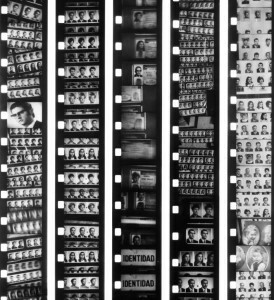 b) A museographic presentation of his artistic work, which starts with the ‘film-sculptures’ of the seventies, most of which were never screened publicly and have been recreated for this occasion, along with other pieces such as V-2, 1974, Photomatons, 1976, Toma-Vistas, 1978, and 133, 1978–79, a film made together with Eugènia Balcells, plusUsession, 2002, Tira tu reloj al agua (Variaciones sobre una cinegrafía intuida de José Val del Omar) (Throw your watch into the water [Variations on a intuitive film by José Val del Omar]), 2003–4, and eGolem, 2007– ongoing, among others. c) Finally, a book entitled Escritos de vista y oído, which includes 24 of Bonet’s texts written between 1975 and today.